One of the biggest casualties of this season’s over-reaching was Major, whose arc was full of inexplicable changes of heart. He started out as the “human” side of Fillmore Graves, attempting to do his best to keep the city safe and balance Chase Graves’ tendency to go for the more extreme option. As the season wore on Major started to lose his sense of self, and become more of a lackey to Chase than the stand-up guy we had grown to love. He pulls himself together, here, charging head first into a heavily guarded execution ceremony to save Liv. I’m glad that he’s finally seeing sense, but there’s been so many moments this season where Major has made choices that seem to make very little sense from a character building perspective. His moment of clarity that I was expecting Major to reach never really happened over the last couple of episodes, with him jumping from point to point with very little rhyme or reason other than he was meant to do these things to progress the plot. Now he’s in charge of Fillmore Graves, and has become the leader that the company needs, after Chase succumbed to his darker side by attempting to scare the city into submission with his public executions and general intimidation. It works to a certain extent since we’ve seen Major talk Chase off many a ledge, but he did very little to earn that position. Maybe the good work he’s due to do next season will be enough to justify his promotion. Another casualty of the writers’ ambitions was Angus. We spent most of this season watching him build up his profile as one of the biggest and scariest zombie leaders in New Seattle. Here, he uses his power to help free his flock of zombies from the quarantine and set them loose on the world. Blaine's manoeuvring ends up backfiring on him, as Angus decides the only way to be a true leader is to lead his people into battle head on...on horseback. There were some fantastic visuals at work with this, namely that shot of Angus leading the charge against the troops waiting to blow his flock to pieces. We never really see a whole lot of this ambush play out, which is disappointing, with the outcome coming across as mostly anticlimactic. With Fillmore Graves rallying behind Major, he manages to kill most of Angus' group, including Angus himself, who we see shot quickly during a TV news excerpt. The lack of fanfare here got me wondering if the charges made against Robert Knepper lead to Angus' screen time getting cut drastically so he could be written out with little fuss. I guess we'll never really know. Blaine may have failed in his mission to profit off the real estate fallout of Angus' proposed escape, but he's now being recruited by Major to keep the brains flowing into the city in light of the military cutting off the legitimate supply. It's an interesting position for Blaine and Don E to be in, especially considering the crimes they've been party to over the last 4 seasons. Will they actually be pardoned for everything they've done? And will Blaine continue to turn every situation he's in to his own advantage? Of course he will, and I'm looking forward to watching him do just that until the final episode. Despite shortcomings in the aforementioned aspects, this finale succeeded in capping Liv's growth into full blown hero. With the release of Levon's documentary showing all of the people Liv saved as Renegade, the public rallied behind Liv's friends to help storm the Fillmore Graves secret warehouse to stop the execution of Liv and Levon. Sadly, Levon joined the ever growing list of Liv's dead ex-boyfriends, as the rioters were too late to stop his execution from going forward. Liv pulled it together fast enough to take out Chase Graves, but when the dust settled Levon's death hit her hard, forcing her to struggle with her role as Renegade and all that it cost her. It’s easy to get why Liv would not want to continue on with the work she had been doing, especially in light of the cure that Isobel's brain would give her. Hasn't she done enough? Hasn't she lost enough? Despite some protests from Ravi, she makes the decision to take the cure. But just when she was about to take it, she gets interrupted by Clive and Bozzio's surprise nuptials. As it turns out, Isobel's brain only provides one dose of the cure, and when Liv sees that Clive and Bozzio were willing to give up having children to be together, her inner hero won out and she selflessly gives the brain to Bozzio. Logically, Liv taking the cure doesn't make sense given that we've a whole season left. But it also makes sense that Liv would be willing to give something huge up to help people in need, just as she did with her own safety as Renegade. It was a nice full circle moment for Liv in respect to her season four journey, and her series long journey as well. She really has become a wonderful hero, and it seems like all of Seattle knows that now. Justin made a random return. I was only just starting to wonder where he ended up after season three finished up. He didn't do much here, only showing slight remorse over his part in the executions. Peyton didn't accomplish anything in Washington, but she certainly made up for it by putting herself in front of Seattle to get the help needed to save Liv. I will always appreciate any amount of Daran Norris, even if it's just one scene like it was in this episode. The writers tried to sell the hell out of Liv and Levon's relationship, but all of the I love you’s fell completely flat. Perhaps we should have seen more of them as a couple for it to feel less contrived. Was Blaine actually worried for his father’s life, or the getting the zombies across the border safely? A surprise wedding in the middle of Police HQ seems a bit out there for Clive, doesn’t it? This finale felt like it was made to stand in as a potential series finale if the show didn't get renewed. Thankfully it was renewed and we'll get to see it end on it's own terms. Major: "A year from now, you'll be patriots. There'll be statues of you in the town square. Zombie children will be taught nursery rhymes about your exploits. Zombie teenagers will go to DeBeers High. There'll be Donnie's Deep-Fried Brain stands all across the city." Please tell me this is the goal for season five. 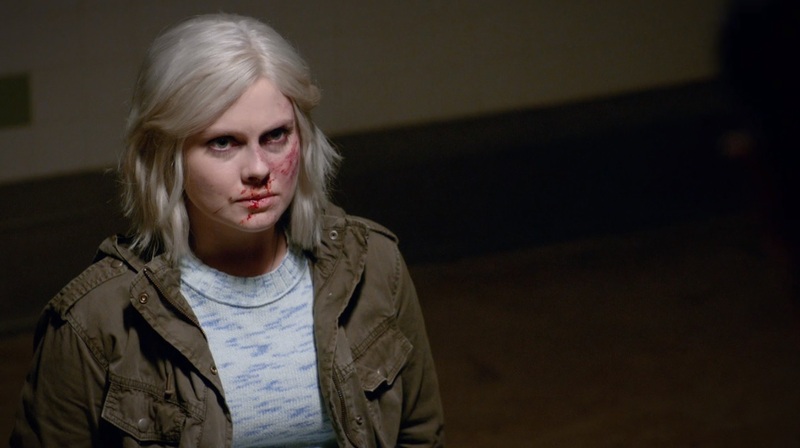 It was the “grandest” of iZombie's four years, but this season was definitely the most uneven one we’ve had. That being said, even at its lowest point to date, this series is still capable of delivering insightful, fun and entertaining drama. In that respect, 'And He Shall Be a Good Man' was the perfect encapsulation of season four's biggest strengths and flaws; it had a few glaring plotting weaknesses, but it mostly got its point across, and it did so with a lot of heart and conviction. Most series wouldn't be able to achieve even a part of what iZombie has with such a limited amount of resources to its name. With a final season looming, I'd like to see an end game drive this show to a nice, smooth conclusion; one that stays true to the series that iZombie is. This episode has wrapped up so many stories, but there are still more left to be told and I hope that we see the writers keep their ambitions in check when closing the door on this world of fantastic characters. 3.5 out of 5 brains. Spot on review, Panda! They tried to fit a 22-episode season into 13 eps. These last few rps felt too disjointed. I hope next (and last :/) season they plan better. They definately didn't earn Major becoming the new commander and I all the FG zombies took Chase dying too much in stride. But all the rest was really good. Some great tearjerkers, mostly the wedding. Final season always sounds good. Writers knowing when the show ends should be the industry standard by now. I binge-watched the entire season (except for the first episode) over three days, and I think it holds up a lot better that way. It didn't feel disjointed to me at all. Yes, there were a few more obvious plot maneuvers. I don't agree with Panda's view on Major's arc. In an earlier review, it was mentioned that Major didn't hesitate to scratch the zombie serial killer who attacked Chase - but he hesitated so much that Chase had to repeat the order! And the confusion about Major buddying up to Russ - when to me it was crystal clear exactly why he was doing it. Distracted watching, maybe? Major's goal throughout the season was to protect the kids in his squad (and later Liv). The best way he saw to do that was by putting himself on the line and gaining Chase's favor. Even pretending to be led down a darker path with Russ he managed to save lives, and didn't care what people thought of him because of it. But Chase shooting his squad was the tipping point. Major had failed in his goal. The show didn't give time for us see what would have happened after this, what Major would have done within Fillmore Graves now that he was disillusioned about using his position there to protect people. He turned down Hobbs' proposition, but that was more about not wanting to be a leader than not wanting Chase gone (very tellingly, he did not tell Chase about the conversation, which of course backfired on him). And every move he made after that was working outside the system of Fillmore Graves rather than within the system as he had before. I do feel he earned the promotion - and let's face it, he didn't even want it and it's going to be a thankless job. Major kept the respect of the other soldiers, and given the built-up of how much everyone at Fillmore Graves had lost confidence in Chase (plus the documentary helping sway opinion against his policies), I found the smooth takeover believable. I'm curious what the last season will be like! I'm glad we get more, though I agree that this episode would have sufficed as a series finale. Liv giving Bozzio Isobel's brain was a lovely touch.